It's sometimes a tough gamble. Quantum's Terry Hutchinson provides rules of thumb for when to foot and when to pinch. The basic concept of going fast-forward in a lift, or pinching in a header, has been around for as long as I can remember-or at least since my junior sailing days when my instructor passed along this tactical tidbit along. Going fast-forward-what's also referred to as "making a bearing gain"-is a great weapon to have in your tactical arsenal. Bearing gain, in its simplest explanation, is when you can sit on the rail and watch as you make trees on your competition. Trees equal boatlengths. To gain bearing on the racecourse you need two things: the first is a boat that is capable of going faster when you press on the bow and twist the sails. A high-performance dinghy can make a better bearing gain than a heavy displacement, full-keel cruiser. The second thing is an understanding of what you're trying to achieve by intentionally sailing high and slow or low and fast. Understanding how to set up your sails to allow for a fast-forward mode is especially important in one-design sailing. This means understanding how to twist your sails, and knowing the difference between reaching and going fast upwind. Bearing gain should come with as little compromise to the height as possible. Shifting into a fast-forward mode could be as simple as applying a little backstay without a sheet adjustment, or maybe easing the mainsheet to allow the boat to unload and go faster forward. In a planing boat, say a 505 or 470, there's a fine line between going fast and sailing out of your lane, but you need to set up your sail trim to be able to do both. 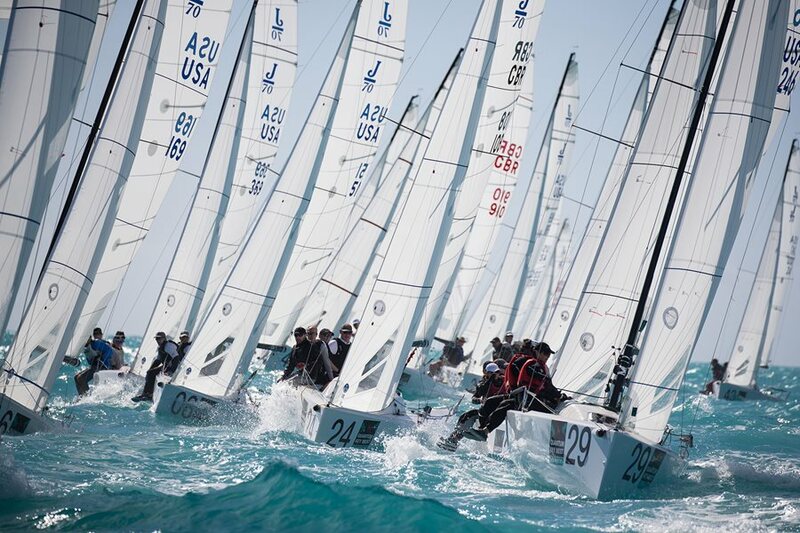 At some point, the extra load put on your foils by going fast should help you hold your lane. To replicate settings for a variety of modes and wind conditions, mark your sheets, backstays, and any other adjustment. If you spend a lot of time trying to get the sails set up properly, chances are you'll miss a brief window of opportunity to go fast. When and where on the racecourse is it best to try and gain bearing? There are many different situations, but generally I'm looking to go fast-forward when I know I'm lifted and leveraged near a corner. For example, if I'm sailing a 2.5-mile beat, and I've tacked on a lift to go toward the top mark anywhere within 2 minutes of layline, I'll work on gaining bearing with the fleet to leeward while also maintaining gauge (the lateral distance between you and the boat(s) to leeward). Another scenario where I'd be looking to gain bearing is in a breeze where the shifts are oscillating within a 5- to 10-minute period. Sailing fast across an oscillating shift allows you to maximize your leverage and use the maximum amount of the shift before the breeze oscillates in the other direction. A bearing gain comes from the twist and setup of the sails, but it also comes when the rest of the fleet is positioned on the outside of a shift or stuck in traffic. At a recent Rolex Farr 40 Worlds, with 38 boats, I was always impressed how traffic could act as a blocker, allowing us to gain bearing when we needed to. The lesson there was to be looking for opportunities to get our bow out in front of a group. When it comes to talking about which mode to sail in, a lot of the conversation at the back of the boat will be based around true-wind direction, heading, and feel. For example, on a boat with lots of instrumentation, the conversation between the helmsman and tactician will be based around true-wind direction. Here's how the dialogue might go: "With a true wind direction of 185, I'm happy to be two-tenths over target." Here, we have twisted sails and we're going fast, but we're not giving up gauge. And here's another one: "Wind direction of 180. Target speed is posted target." In this case, the sails are set in a normal upwind mode with normal twist profiles. "Wind direction is 175, 5 degrees left of average. Target is top speed. Happy to be two-tenths under posted target speed." It's critical to be aware of what you're doing when you're going for a bearing gain because you do not want to spear off into a corner, potentially sailing extra distance for a shift that never materializes. Therefore, going toward a layline when one tack is long, or going fast in shifty conditions, are the two situations where I really focus on it. But when sailing in the open course, make sure you're monitoring what's happening elsewhere. The team needs to be talking about the changes so the helmsman knows when the mode is working or not working. First and foremost, I try really hard not to sail in headers. Rule No. 1, sail the lifts, makes life much better. But if you find yourself out of phase, you need to know how to sail the boat two-tenths under target for a period of time. When would you want to do this? A few examples include getting off the starting line, away from a leeward mark, or when a boat is on your leebow, heading into a persistent shift. Another one would be when you're on a layline in the dirty air of a competitor. In a venue such as Long Beach, Calif., where the locals know to head toward the right side of the racecourse after the sea breeze fills, sailing in high mode is imperative. As a boat stuck in traffic, knowing I have to go right, I would intentionally sail a higher, slower mode to play out the long-term tactical plan. More often than not, the high/slow mode is a traffic mode. If you find yourself in this mode to execute a tactical plan, adjust your sail setup accordingly. This can mean a tighter leech on the jib and more load on the mainsail. In some cases it's traveler up with normal trim and pinching on the jib. It can also be more sheet tension while the boat briefly sails high to open windward gauge. I prefer the combination of traveler up slightly and normal sheet tension, which creates a loaded feel to the boat and allows enough twist to build speed when necessary. Understanding your tactical needs at the time should be the driving factors in selecting any given mode. If you make the decision to go fast-forward, everybody on the boat needs to understand what you're going for at the time and why. This will allow for a constant stream of feedback of performance versus competition so you will know when to change modes. Knowing your set up allows you to quickly and efficiently go from a normal, to fast, to high mode trim. Finally, if you're blindly sailing high and slow, or gaining bearing, there needs to be the conversation of what is the tactical goal for the next three minutes. This basic tactical understanding for the given situation will lead to a better plan, better communication, and ultimately a better result. This article originally appeared on SailingWorld.com as part of the Terry's Tips column.